Today is the “International Save the Dolphins” Day. A peaceful demonstration will be held in front of the Japanese Consulate-General, located at 350 South Grand Avenue in Los Angeles from noon to 4 p.m. This is part of a worldwide rally that involves as many as 17 other U.S. cities and 25 countries. Ric O’Barry, an activist from the Academy Award-winning documentary, “The Cove,” orchestrated the event that hopes to call worldwide attention to the dolphins’ plight. Besides demonstrations in the U.S., Europe, Africa, Asia and the Middle East, there also will be a demonstration in Taiji, Japan, where the dolphin focus began. Starting in September each year, 20,000 dolphins are killed for meat that is riddled with mercury. A small portion of the dolphins are saved and sold to animal parks around the world. 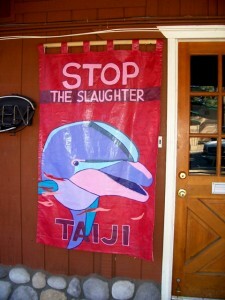 “Most of the Japanese don’t know that this is going on,” said Ric O’Barry in his blog site, savejapandolphins.blogspot.com. The reason that the demonstrations are happening today, he said, is to let everyone know that the Japanese government will be handing out 23,000 permits to Japanese coastal communities who want to kill more dolphins. Only a few dolphins are sold (at a great profit) to aquariums and swim-with-dolphins programs. The rest are slaughtered for meat that is inedible. Julia Ramsey, who is leading the demonstration outside the Japanese Consulate-General in LA today, sent out instructions to demonstrators via e-mail and Facebook. Since the Japanese consulate is located on the 17th floor of the Deloitte-Touche high-rise, Julia suggested that demonstrators bring their signs and stand outside on the sidewalk. Blocking a city thoroughfare, sidewalk or street can result in a $250 fine. Julia also instructed dolphin demonstrators to wear their “Save Japanese Dolphins” T-shirts and bring their own signs. However, she said that the language needs to be respectful. 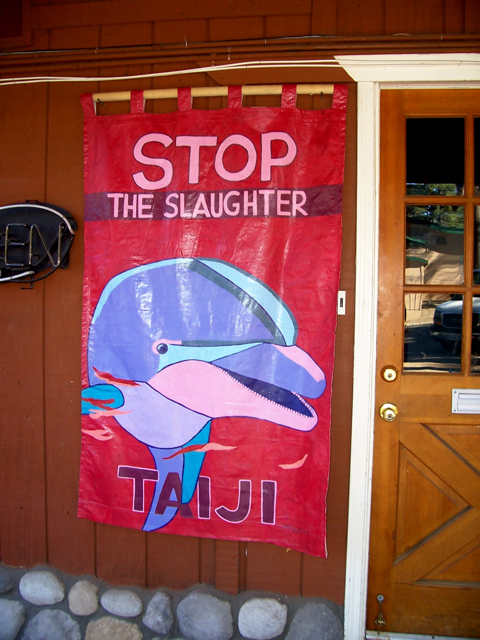 Idyllwild Me editor will attend the rally, along with her hand-painted “Save the Dolphins” T-shirt, sign and camera to capture the essence of the LA demonstration. The LA “Save Japan’s Dolphins” rally will be held today from noon to 4 p.m. outside the Deloitte-Touche building located at 350 South Grand Avenue. For more information, contact Julia Ramsey at ramseyjulia@gmail.com, or visit Ric O’Barry’s blog site, www.savejapandolphins.blogspot.com.